SURFSIDE and SUNSWEPT are our studio, one and two bedroom units. If this studio is booked, try our other studio, Surfside 361617.
the panoramic views always steal the show! It includes a 10 cu ft refrigerator and balcony electric grill. Two persons MAXIMUM in this studio, please. This premium studio is in the back building on the ideal 3rd floor beside the elevator. Enjoy morning coffee on your private roofed balcony with granite counter just steps from the turquoise waters and beach. Gaze at the harbor, ferry dock, and outlaying islands and watch the comings and goings of marine activity. Ease into the day, enjoying cool breezes as the island awakens. An ideal size for two adults, this especially quiet unit is located on the third floor of waterfront building D.
Featuring shades of aqua, blue and green, our oceanfront studio offers a sitting area with sleeper sofa and large flat screen TV (60 cable channels and DVD player), Tommy Bahama king size bed and dresser, full bath, washer/dryer, and granite-topped kitchenette equipped with microwave, full refrigerator, sink, coffee maker, toaster, and blender; and your own private balcony and entrance. In addition to tropical landscaping and well-kept grounds, Grande Bay resort offers an appealing pool and sun deck as well as hot tub and state-of-the-art fitness center.The front desk of the lobby is staffed 24-7 to answer questions. An elevator transports you and your luggage right to your door. If you book with us, our property manager will greet you at the Cruz Bay ferry dock and transport you to Grande Bay. Later, catch an open air taxi to the world-renowned north shore beaches (Hawksnest, Trunk Bay, Cinnamon, Maho, etc.) minute away. (We provide beach chairs, towels, and a cooler.) In the evening, walk the short block to town for light fare at the Beach Bar or High Tide or enjoy a gourmet dinner at the Waterfront Bistro, Morgan's Mango, or the Lime Inn. And this is only your first day in paradise! This couple has 3 married children and grands who also enjoy hiking and snorkeling on St. John. He is an environmental engineer; she is a communications director. After years of exploring the Virgin Islands through bareboat sailing rentals, we chose St. John because of the spectacular scenery, the warmth of the island people, and the perfect weather. We love the ever-changing vistas of the harbor: pelicans diving, sailboats coming and going. Hiking and snorkeling are our favorite activities. The proximity to town is another plus - we love leaving the car behind and walking to the many wonderful restaurants in Cruz Bay. This unit has amazing and spectacular view of the harbor and outlying islands. It was completely renovated in 2014. We love the super - comfortable Lexington Tommy Bahama bed. Loved the condo. So very pretty and comfortable! The bed was fabulous as were the sheets. Enchanting view and so close to everything! The property managers were great and very responsive. Only small complaint was when we took showers everday around 6 pm is the water would only get lukewarm. We thoroughly enjoyed our time at Sunswept and willl definitely be back. We just returned from a wonderful 5 night stay at Sunswept. We found the location to be fantastic... after a day of exploring we would park the jeep and stroll into town for dinner. The condo is very comfortable and well stocked with everything you need. The porch was ideal for morning coffee.. I am still daydreaming about it! We would absolutely stay here again!! This is a nice unit with a view of Cruz Bay harbor from the deck. Some challenges on day 1 when the prior tenant reported the TV was out. At first the owner indicated it would be a day or so until I asked that she expedite getting a working TV since we had not seen a TV for a week and wanted to get out of the sun for a bit and start to get back to society. Fortunately the property management conpany came through quickly with another TV from a different unit within a few hours. Kind of weird that there are pictures of the owners family all over the unit. Would rather not have seen that. Owner also has warnings in unit about limiting water and electrical usage which I would not have expected to see given the nightly rates. There is a nice selection of beach chairs and other beach toys in the owners locker which we didn’t use. One other small thing was that the cooler provided was falling apart. Slight inconvenience when you are walking to the beach and the plastic bottom of cooler keeps falling off, but we made the best of it. Grande Bay has a nice pool and hot tub. You can walk from here to just about anywhere in Cruz Bay. 5 minute walk to main ferry terminal. All in all we would return to this location for our next trip to Cruz Bay. My wife and I had a great time. Sunswept is is nice, the location and view is great. We will definitely be back. We enjoyed a blissful, sunny, warm 10 day stay in the Sunswept studio over Valentine's 2019. So much love for all that is St. John!! Anna May and Peter's accommodations in Grande Bay were perfect - as was all (beaches, sun, snorkling, restaurants, bars etc...) that filled our ten day stay!! We will be back in 2020!! 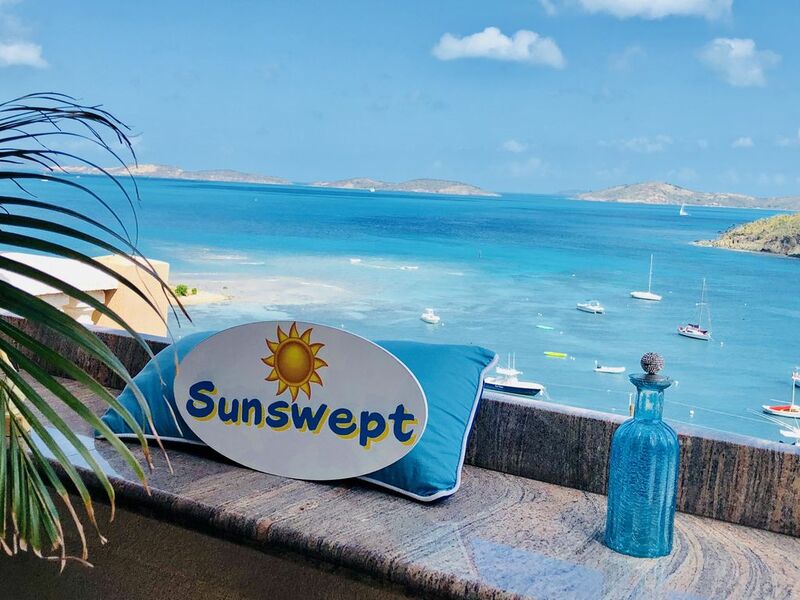 My wife and I enjoyed our stay in St. John in the Sunswept studio. The location is great, close to restaurants yet still relatively quiet. The view of the harbor from our balcony was great. Our studio was clean and well appointed. Plenty of towels, a great shower and the kitchen although limited worked well for us. Cancellations more than 60 days before arrival are refunded the deposit. There is a $75 cleaning fee added to stays of less than five nights. This is a no smoking resort; this is strictly enforced. Guests under 26 years old may stay only if parents are residing in the same unit.